About four Sundays ago, Marcus and I went to dinner with Lisa at Takashi over in the West Village. 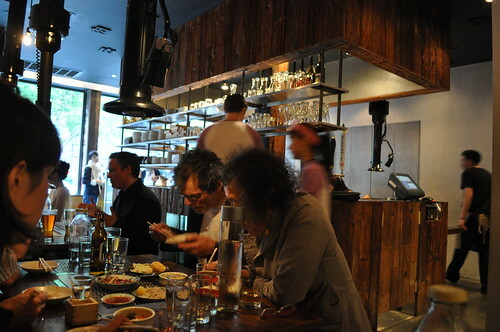 Lisa and I had been talking about trying this Japanese-Korean restaurant for quite some time now (again, thanks to Sam Sifton's review in The New York Times), so we thought nabbing a last-minute table at Takashi on a Sunday evening would be feasible. It was so last-minute in fact that I had called that Sunday afternoon with the tiny hope that the restaurant could accommodate our party of three. I had expected a pushy staff to nearly laugh in my face for thinking I could call the day of for a reservation along with long waits outside the restaurant, but instead, I was met with the friendliest of staff (the maître d' was patient and helpful) and a low anticipated wait. I had asked him if it would be possible to make a reservation for a party of three for dinner later on that evening. As I already knew the policy was that the restaurant only took reservations for four or more, I was hoping I could squeeze by this somehow. And guess what?! We were in luck! He told me that he'd be happy to make a reservation for me, so long as my entire party would all be punctual for the reservation time and so long as it didn't get too busy that night (which he reported as it usually didn't). With that, I knew I liked them already! Inside the intimate 34-seat restaurant. 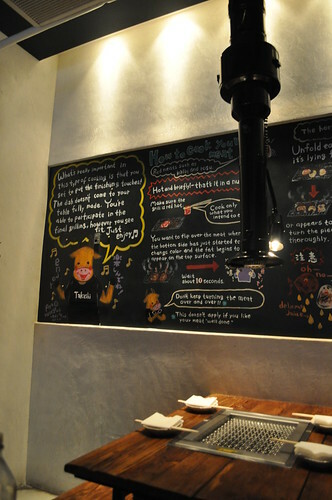 The fun illustrations and detailed explanation behind Takashi and its menu appear on the blackboard along the side of the restaurant. I should also probably mention that its menu is all beef. So if you're not a red meat eater, then Takashi isn't the right place for you. 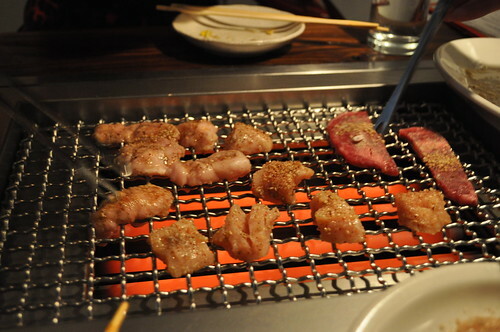 Choice cuts of premium Japanese and American angus as well as assorted offal called horumon (i.e., Japanese for "discarded goods") are served raw to be grilled at your table (called yakinuku). There are also items on the menu that are served simply raw (called nama), recommended before the cooked portion of the meal. The restaurant spent months hand-picking where each cut of beef would be sourced from, "settling for nothing but the tastiest meat from sustainably-raised cattle with no antibiotics of hormones." Among Takashi's smorgasboard of beef offerings are sourced from local New York state farms, from Kansas's Creekstone Farm, and Oregon's Washugyu cows. 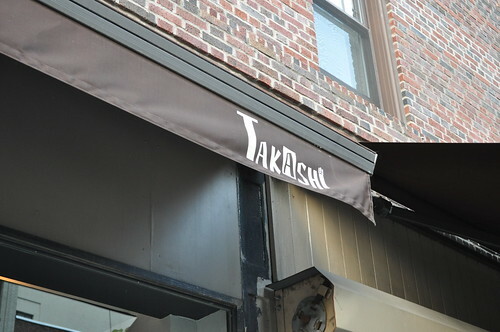 Takashi is run by Chef Takashi Inoue, a third-generation Korean immigrant born in Osaka, Japan. His menu is inspired and influenced by his heritage, "combining the bold, heartiness of Korean flavors with the finesse of Japanese cuisine." 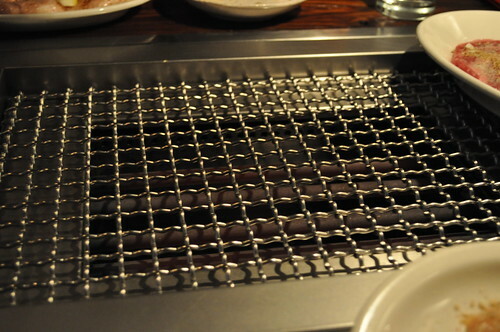 The grill for the yakiniku portion of the meal. We were served a mix of small plates before the menu items were served, which included pickled bean sprouts, kimchi, and an iceberg lettuce salad with this awesome Asian-flavored vinaigrette. We started off the raw portion of our dinner by sharing the nama-senmai, flash boiled third stomach with spicy miso sauce and fresh scallions. The texture was very similar to jellyfish if you've ever had it before (i.e., a combination of chewy-crunchy). This was a little bit of a letdown as there didn't seem to be much flavor that permeated throughout -- it was mostly bland. Our second nama course was the yooke, which was thinly-sliced chuck eye beef tartare in special sauce topped with a raw quail egg yolk, Japanese seaweed and wedge of lemon. Our waiter broke the egg yolk with a pair of chopsticks and mixed it in with the beef tartare and the other ingredients. Here is the yooke in its final form, ready to be eaten. The egg yolk made the cuts of chuck eye a more cohesive unit, allowing for the nori and seasoning to be evenly spread throughout. 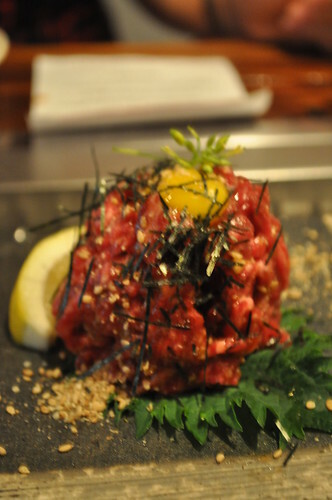 We enjoyed this tartare course very much -- it definitely had stronger and more interesting flavors throughout, and the meat was very tender and easy to chew and eat. The yooke is definitely something you should order from the raw list. We also ordered the niku-uni from the nama section of the menu, which is chuck flap served on leaves of seaweed and shiso topped with raw sea urchin and fresh wasabi. 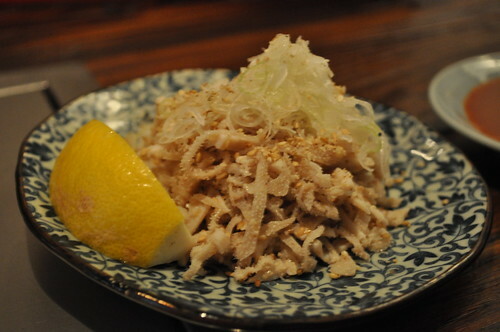 It is one of the most popular items on Takashi's menu. As Lisa is a huge uni fanatic (myself too), there was no way we could pass this up on the menu either. So seriously, amazing stuff here. 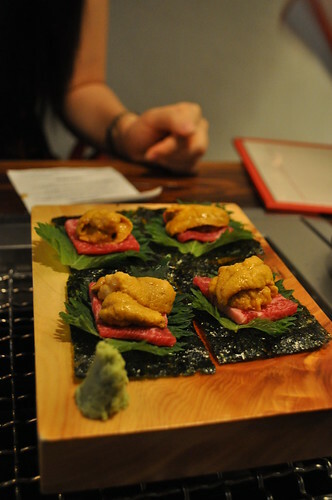 The chuck flap and uni were enveloped with the freshness of the shiso leaf and the crispness of the square sheet of nori, almost like a Japanese version of a taco. The savory texture and taste of uni complemented the tenderness and full flavor of the chuck flap. If there's any doubt in your mind that you'll enjoy this, remove any ounce of doubt and take that leap of faith. It really is as awesome (if not more) as it sounds. Even Marcus, who has been on the fence about uni, reported that he was shocked at how good it was. To continue our dinner into the yakiniku portion of the meal, we ordered the rosu (ribeye), which we opted to be marinated in Takashi's sauce.Whatever the mystery sauce was, it worked wonders for the slices of ribeye. If you're looking for something simple (aka, you prefer to stay away from offal/innards), the rosu is a very safe bet. Simply grilled at the center of the table, the ribeye meat was perfect at a temperature of medium rare -- very soft, juicy, and tender throughout, dripping with the optimal amount of Takashi's marinade. 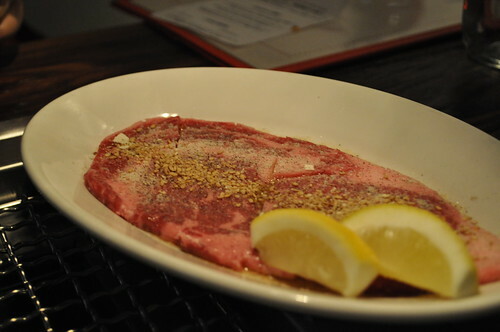 Once the meat is grilled to your desired temperature, our waiter suggested we squeeze a little lemon juice on it for extra flavor. 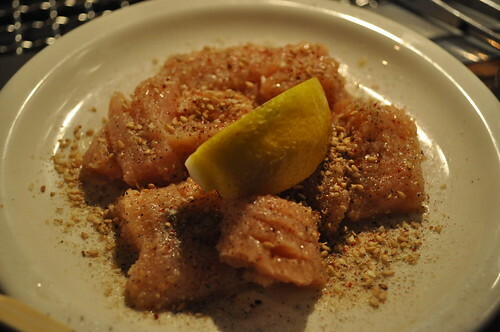 We also ordered mino (first stomach), opting for the dish to be seasoned with salt, garlic and sesame oil. I usually go gaga for tripe (gotta love it in Asian cuisine), but I was very disappointed with the mino. I think it may have been partially our fault because I think we overcooked it past its ideal temperature. It was really chewy and tough, making it very difficult to eat. The marinade was great, but just not enough to make up for the texture. Lisa thought it'd be fun to try the shibire (sweetbreads) seasoned with salt, garlic and sesame oil, as we've had pretty delicious experiences with sweetbreads. I found it quite funny that this was the first thing Lisa wanted to order from the yakiniku section of the menu. To my surprise, this was even better than what I had expected. They were dense and rich with flavor while maintaining a silky soft texture, and the seasoning seeped in very nicely, highlighting its almost bacon-like taste and flavor. 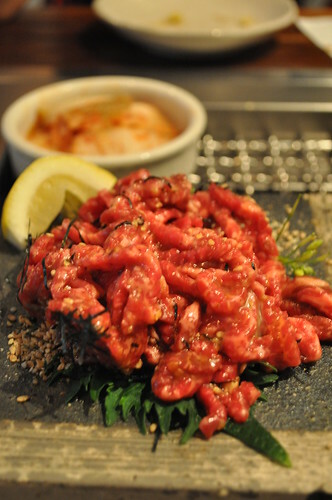 Along with the niku-uni, this is another must-order, especially if you're fond of being "adventurous" when it comes to offal. The three of us grilling our main courses. 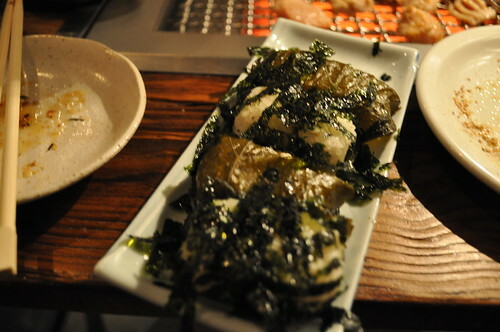 On the side, we ordered one order of bakudan (Japanese for "rice-bomb") served with Korean seaweed and pickled sesame leaf. For me, I enjoyed the bakudan wrapped in Korean seaweed a little bit more than the pickled sesame leaf, but both rice-bombs definitely had more flavor than plain white rice. and soybean flour), azuki (sweet beans), and caramel syrup. "The works" is definitely the way to go with this dessert, where this combination of Asian ingredients and flavors yields the ultimate soft-serve experience. 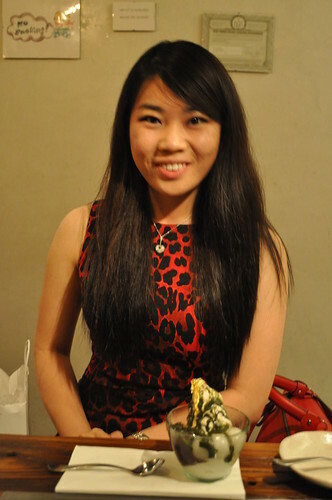 Lisa and I shared the same dessert, only ours had green tea syrup instead of caramel syrup. Between ours and Marcus's, I really liked the green tea syrup (then again, I love green tea ice cream), while Lisa and Marcus preferred the caramel syrup. So definitely get "the works" with your preference of green tea syrup or caramel syrup. Findings: The three of us had an awesome dinner at Takashi . The restaurant's concept for the menu (i.e., entirely beef) was certainly interesting, as you would probably expect a bovine-centric restaurant to be more like a steakhouse, but it is so much more than that. It is an intimate restaurant, where the portions are not overwhelmingly gigantic (as most steakhouses are) and the waitstaff is very friendly and knowledgeable about the menu's unusual ingredients. You also don't feel as if you're eating too unhealthily because of all this red meat you thought you'd be consuming. The array of prime cuts (ribeye all the way) and offal (its sweetbreads are great) is variegated in type and seasoning so that you're bound to find something to suits your tastes and preferences. 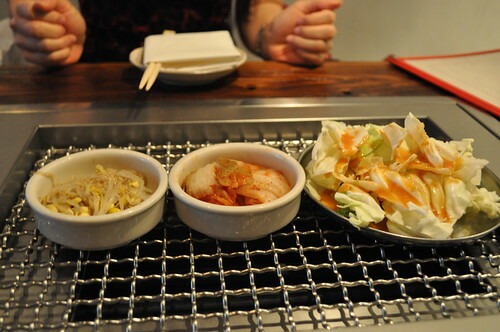 In addition, the nama portion of the menu has a lovely selection of atypical "raw" preparations. The niku-uni and the yooke were solid items to order as they are very unique in ingredient and combined taste. 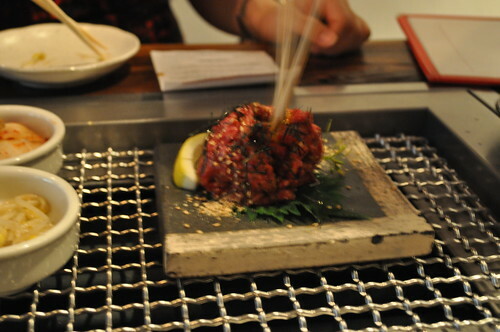 Overall, I would say to expect an interactive and appetizing dining experience at Takashi. 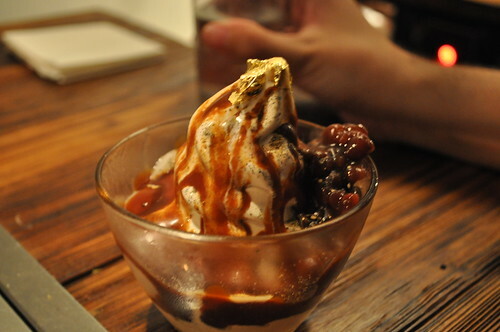 Price point: $14-24 for each nama dish, $12-24 for each yakiniku dish, $10 for soft-serve ice cream with the works.